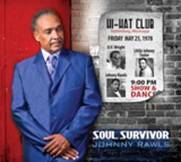 EL PASO, TX – Catfood Records announces a June 19 release date for Soul Survivor, the new CD from Blues Music Award–winning singer Johnny Rawls, with national distribution by City Hall Records. Soul Survivor is the follow-up to Johnny’s 2011 CD, Memphis Still Got Soul, which has received three nominations for the upcoming Blues Music Awards to be presented in Memphis on May 10. Johnny is nominated for Soul Blues Male Artist and Soul Blues Album, as well as Song of the Year for the title track from that CD. Living Blues magazine called it “an unabashedly roots-rich outing, featuring Rawls’ voice at its meatiest and his guitar work at its most elegant and understated.” A previous album, Ace of Spades, won the BMA in 2010 as Soul Blues Album of the Year. Soul Survivor is Johnny’s strongest album yet. The CD was produced by Johnny Rawls and Bob Trenchard and recorded primarily at Sonic Ranch Studios in Tornillo, Texas; with one song recorded at Soul Tree Recording in Helena, Montana. Most of the musicians on each of the sessions also played on Johnny’s last three albums. Included on the Texas sessions are members of The Rays, a band Rawls discovered in 1999 and subsequently produced for his own Deep South Soul Records. The band includes Richy Puga on drums and percussion, Dan Ferguson on keyboards, Bob Trenchard on bass, Andy Roman on sax, Mike Middleton on trumpet and Robert Claiborne on trombone. They are joined once again by Johnny McGhee, former LA Motown studio musician (Marvin Gaye, Diana Ross) and guitar player for the group, LTD, who has now become the studio guitarist for The Rays. Jessica and Jillian Ivey sing background vocals. Along with his recent three nods, Johnny Rawls has now received eight BMA nominations for his last four CDs. The previous ones came for his albums Heart and Soul in 2007; and Red Cadillac in 2009. Both Red Cadillac and Ace of Spades were nominated for Album of the Year by Living Blues and won the Critics' Choice Southern Soul Album of the Year Award. Red Cadillac also reached #1 on the Living Blues Radio Play Chart, while Ace of Spades hit the #4 spot, remaining in the top 20 for three months. “Johnny Rawls has carved a niche for himself as a master of soul-blues, delivering uptempo songs with solid pop hooks, as well as smooth vocals with just the right touch of grit and Stax-style horns,” said Blues Revue. Born in the southern Mississippi town of Columbia, and raised in Purvis and Gulfport, Johnny Rawls - while still in high school - was already backing such stars as Z.Z. Hill, Little Johnny Taylor, Joe Tex and The Sweet Inspirations when they toured in his area. In his early 20s, Rawls was hired by the legendary deep soul singer, O.V. Wright, as his band director. After Wright died in 1979, Rawls kept the band together and toured for several years with Little Johnny Taylor and others. As always, Johnny Rawls continues to tour consistently, performing 150 dates a year, both in the U.S. and overseas. For more information, visit www.catfoodrecords.com and www.johnnyrawlsblues.com.